Tangkoko National Park is a huge natural reserve on the northeast tip of Sulawesi island in Indonesia. This park covers 21,000 acres of jungle, and there are hundreds of unique animal species living here. The best part about Tangkoko is that it’s super easy to visit on a budget, and epic wildlife sightings are practically guaranteed. Fly to Sam Ratulangi International Airport (MDC) in Manado. Citilink has connecting flights to this airport from Bali or Singapore, and they have direct flights from Makassar (UPG). Tangkoko National Reserve is in north Sulawesi, about 40 miles (60 km) east of Manado, but it takes about 1.5 to 2 hours to drive there because of the winding jungle roads. The good news is that the drive to Tangkoko gives you some incredibly scenic views of jungles and volcanoes. 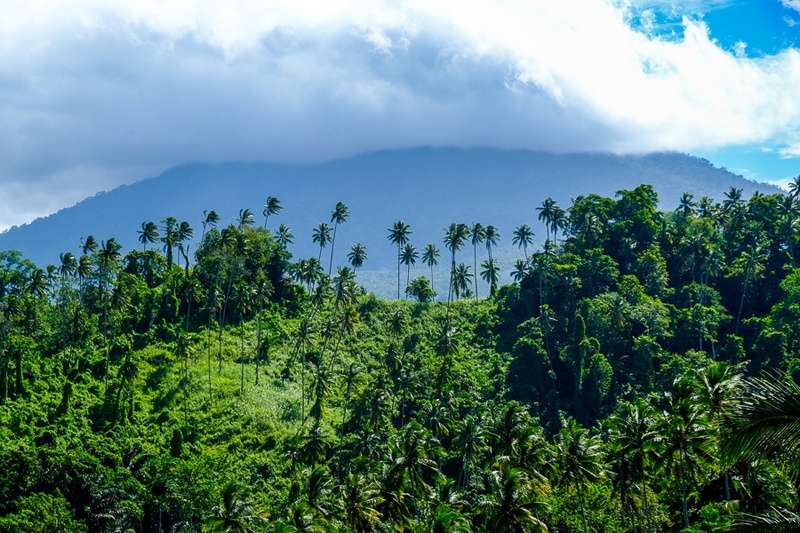 Rows of palm trees cover the green hills, and the Mount Tangkoko volcano can be seen stretching up into the clouds. It was an absolutely epic Indonesian landscape that made the 2 hour drive seem to go by in just a few minutes. Tangkoko National Park is a 2 hour drive from Manado, Sulawesi. If you go to Tangkoko with a driver, the best and cheapest way to do this is to download the Go-Jek or Grab ride hailing apps. Either app will work in the Manado area, but Go-Jek is usually cheaper and better. I used Grab car for this and the whole process went smoothly. Hotels at Tangkoko can usually provide a transfer if you ask, but the price will be quite a bit higher. My hotel quoted 300,000 to 400,000 IDR ($20 to $27 USD) for a one way transfer from Manado to Tangkoko. A GoCar taxi ride with Go-Jek should be about half this price. If you happen to be traveling on a very thin budget, then there’s also a bemo bus service you can use to go from Manado to Bitung to Tangkoko, but it’s pretty complicated and may not be worth the extra time and hassle just to save a couple dollars. The only way to visit Tangkoko park is on a guided walking tour that lasts about 4 hours. Hiring a guide is required for this, but any hotel at Tangkoko can easily arrange a guide for you. The guide fee is 200,000 IDR ($14 USD) for a morning hike, or 100,000 IDR for an evening hike, but these prices can be negotiated, especially if you go in a group. There’s also an entry fee for the park that costs 100,000 IDR ($7 USD) for foreigners, and 5,000 IDR for Indonesian residents. The entry fee has to be paid each day you enter the park, so if you do multiple tours of Tangkoko on separate days then you will have to pay the guide fee and also the entry fee each time you visit. The fees sound bad at first, and they’re definitely on the high side for what you’d normally expect in Indonesia, but I think the incredible wildlife you can see here makes it worthwhile. The jungle walk is pretty straightforward and not strenuous at all. It follows a flat path through the jungle that is mostly paved at first, and then at times cuts through the trees on a dirt path. I wore sandals and didn’t get any bug bites, but this was in the dry season, and the reserve is also known to have black tarantulas, so wearing shoes and bug spray is probably best! The biggest reason to tour Tangkoko park is to see the wildlife. There are literally hundreds of Indonesian animal species living in the park, including a bunch of endemic species that only exist in Sulawesi. I spent two days touring the park, and in total I saw at least 50 black Sulawesi macaques, rare birds (kingfishers, owls, and hornbills), lizards, snakes, cicadas, tarsiers, and more. You can also see Cuscus bears and huge black tarantulas here. If you spend one or two days touring the park, you are almost guaranteed to see a bunch of the Sulawesi black macaques (the locals call them ‘yaki’). These monkeys are endangered and can’t be found anywhere in the world outside of north Sulawesi and a handful of tiny islands near Sulawesi. Only about 5,500 of the monkeys are still living in Sulawesi. If you’ve ever visited the Sacred Monkey Forest in Bali, you’ll be happy to hear that the Sulawesi monkeys are much more friendly and less aggressive than the Bali monkeys. They won’t attack you or try to steal your stuff! The macaques in Tangkoko park like to travel in ‘troops’ of about 25 monkeys at a time. There are two main troops living in the park, but only one of the troops is comfortable around humans and easy to photograph up close; the others wouldn’t let me get within 50 yards. All of the baby macaques were also extremely shy and I had a hard time getting a pic of one. Tangkoko Nature Reserve is one of the best places in Indonesia (or the whole world) to see endangered tarsiers. These are the tiny, bug eyed primates that are usually very elusive and hard to approach. They can sometimes be seen during the day, but generally the best time to see them is in the evening or at night when they wake up from their naps and come out to eat all the bugs. I saw tarsiers during both of my jungle tours at Tangkoko and it was a special experience for sure! There are only a handful of countries where you can see these critters. If you have time, be sure to ask your Tangkoko guide if you can see the black beach. This is a cool black sand beach created by the volcanic activity from Mount Tangkoko. The beach doesn’t have a name as far as I know, but it’s just a 5-10 minute walk from the entrance of the Tangkoko Nature Reserve. Sometimes you can even see a group of the macaques hanging out on this beach. Technically you could visit Tangkoko as a day trip from Manado, and come back to town in the same day, but I wouldn’t recommend this. If you really want a good chance to see plenty of wildlife (especially the tarsiers), then I would recommend spending at least two days at Tangkoko. I spent two days and one night at Tangkoko Hill Cottage & Resto, and this was enough time to do two full tours (one in the afternoon and then another the next morning). I saw lots of wildlife, including the macaques and tarsiers on both days. This also gave me enough time to visit the black sand beach at Tangkoko. There are several places to stay near Tangkoko, but Tangkoko Hill is the best value and highest rated. I had a great experience staying here, and the host Frankie was super helpful with arranging walking tours for Tangkoko and found a driver to take me back to Manado after I was done visiting the park. The climate of Indonesia is tropical, so the weather is hot and humid year round. For north Sulawesi, the best time to visit is from May to November, when the conditions are more dry and sunny. I went to Tangkoko in mid-August and this turned out to be a great time to visit; there was no rain at all.